I was surprised to see locally grown green peppers–(they are lighter and thinly fleshed)–in the market yesterday, nudging small white peaches on a new stall. Everything is so late this year. I remembered a recipe I used to do years ago from Antonio Carluccio’s Vegetables book. Very Italian–simple and different. 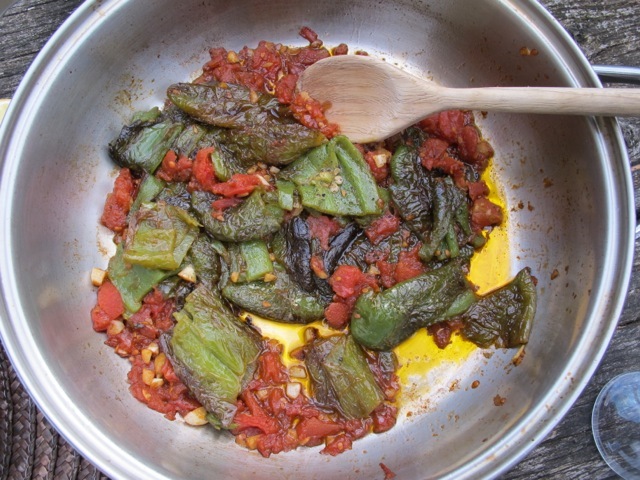 The peppers are cooked whole in olive oil. They collapse, charring nicely and are finished in a quickly cooked tomato sauce. 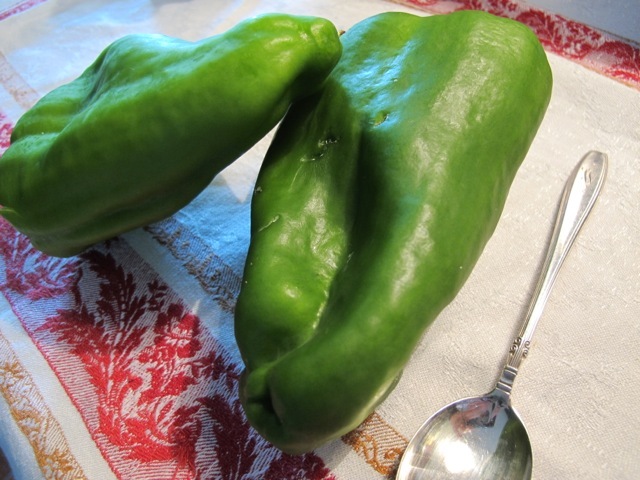 If these particular peppers are unavailable use thicker fleshed ones–deseeded and cut into largish pieces. Heat the oil in a deepish pan. When the oil is hot carefully slide in the peppers–you may have to do this in two batches. Turn them as they collapse and brown, for about 5 minutes–they should be tender. Set them aside and spoon off four tablespoons of the oil–(I used this oil for sautéing later). Slip the garlic into the oil. When it starts to colour, mix in the chopped tomatoes. Cook these over a high heat for five minutes to form a sauce. Stir in the peppers and cook on for another five minutes. We ate these for supper last night served on lightly sautéed (in the excess oil) slices of leftover chickpea “bread” . A recipe remembered and reclaimed. 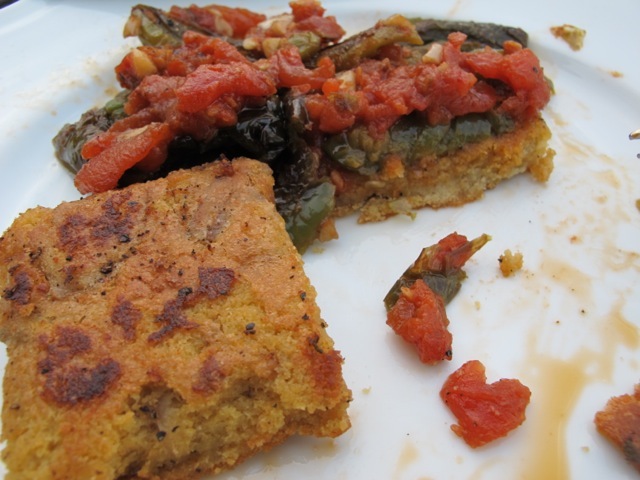 The chickpea bread has proved a hit here, especially when dining al fresco/having lunch in the garden. I haven’t used green peppers for a very long time, but this looks just the recipe to get me going with them again. Thank you. I often leave the seeds in with the peppers. I have always liked the seeds, kind of for a “nutty” texture addition to the sauce. Is there some reason not to do that? Do you think leaving in the seeds harms the flavor? Thanks Robin! I left most of them in the other night! Perhaps the younger more delicate the peppers the more you can leave in. If you like the taste of them though (nutty), a toi de choisir, Steven!